Haute Mother Vintage is Liquidating 30 Years of Inventory This Weekend! Haute Mother Vintage Liquidated 30 Years of Inventory! For 30 years, Jackson–a singer/songwriter, former owner of beloved, longtime Montrose shop Fashion Plate (now closed), and the stylish force behind Haute Mother Vintage—has amassed an impressive collection of vintage fashion. ...Zoë was (and STILL IS) the pioneer of her own empire. This songstress, supermodel, enterpreneur, fashion icon, and most importantly - SUPER MOM, is well known in Houston and abroad for her many talents. One thing that is undeniable is her contagious and genuine aura. Zoë lends her heart and style to benefit The Women's Home! Mark Weber Blogs About Zoë! Preview, buy, and download songs from the album Stylish Melodies - EP, including ”Everybody,” ”I Got U,” ”24 Hours,” and many more. Buy the album for $4.95. Songs start at $0.99. Looking for ways to impact a life? Join the "I Got U" Movement 5K Walk/Run, Saturday, November 14th, 2015. There are ways to help others that don't require money, and that money can't buy. If you're looking to provide that for someone. The spirituality of the "I Got U" Movement is evident, and is a part of the 5K Walk/Run Event, Saturday, November 14, 2015. Zoë’s Healing Focus for 5K!!! Selflessness, and overall enrichment is the foundation of the "I Got U" 5K Walk/Run. The Overcomer Wants You to Come Out!!! The "I Got U" 5K Walk/Run, Saturday, November 14, 2015 in celebration and in support of singer, songwriter, Zoë. ...and enthusiastic reviewers have compared Zoe's sound and style to people like Sade and Erykah Badu; enigmatic, laid-back and soulful. Zoë is featured in the UK! I would like to introduce you to a singer, songwriter and Lupus survivor, Zoë-Fashion Plate, who has resumed her music career with the release of a 5 song “mini” cd entitled, “Stylish Melodies”. The first single was “I Got U”. The new song of focus is called, “Everybody, and is a mid-tempo invitation to “get up” and “grab” somebody. The CD is available on ITunes https://itunes.apple.com/us/album/stylish-melodies-ep/id1019731404 Google Play https://play.google.com/store/search?q=zoe-fashion%20plate&c=music&hl=en Amazon http://www.amazon.com/Stylish-Melodies-Zo%C3%AB-Fashion-Plate/dp/B011RAFH22/ref=sr_1_5/185-1305480-3491563?s=dmusic&ie=UTF8&qid=1437097028&sr=1-5&keywords=Zoe-Fashion+Plate and other digital retailers. Zoë and Dede Make Music News! Lyrically I’m very present in making sure that the messages that I’m writing are messages that are lasting but I look to great artist as well. Port Arthur “Platforms” Port Arthur!!! "small town, BIG People" Blog Features Zoe! PA News Acknowledges Zoë’s Parade Participation! The Breeze KSAP-LP 96.9 Interviews Hometown Girl! Zoë is interviewed while new single, “I Got U” spins over the airwaves. Mayor Anise Parker Awards Zoë a Day! "Zoë Jackson-Jarra will be honored by Riyad Abu-Taha of The Ambassadors Club and Freelance Media Group for 25 years in the music industry." Congresswoman Sheila Jackson Lee Honors Zoë!!! Zoë’s community service yields her a Congressional Proclamation. Zoë Gets the Front Page, Again!!! Later in the day…kicked off her “I Got U” campaign to promote acts of kindness for others each day. “Zoë, I Got U” Day Recognition!!! Houston Honors Zoë with a PROCLAMATION!!! “Zoë I Got U” Day recognized annually, May 9th. A Pic and a Paper in Port Arthur, Texas!! Port Arthur News Acknowledges a Native! Port Arthur Texas Visitors Bureau announces Port Arthur native, Zoë-Fashion Plate’s return to film music video for new single, “I Got U”. Port Arthur, TX Rewards One of its Own! New Single, “I Got U” played “Across the Pond”! …New soul/pop single by Zoë-Fashion Plate entitled, “I Got U”, “soothes” the ears of listeners. Zoë on Fashion in her own words! Zoe Serves up Vintage from a Boutique Platter!! A Fashion Mind for a Festival! Neiman Marcus Checked Out By Zoe!!! Zoe Eyes the Retailer” Window! Zoe Remarks on Art Cars!!! Houston Style Mag and Macy’s Sage Highlight Fashion! Zoe Delivers What Ben Sees!!! A Fashion Blogger and a Fashion Plate Team Up! Zoe-Fashion Plate Puts her Stamp on IFest! Mixed Media on a Model!!! Fashion show in the Wade Wilson Art Gallery! Zoe and Lloyd Gite phototographed at inaugural event. Theola Petteway and Zoe photographed at the NAACP party at Advantage BMW in Houston. Mandela...a Man after God's Own Heart!!! “Ubuntu” is a term used in South African and other places and is loosely translated as “human kindness” and is a term for a kind of humanist philosophy, ethic or ideology. It seems to have spurned that kind of mood amongst world leaders everywhere and the communities that they govern as all eyes are now on South Africa with the passing of Nelson Rolihlahla Mandela. Mandela was a South African anti-apartheid revolutionary, politician, and philanthropist who served as the first black President of South Africa from 1994 to 1999. He was 95 years old. Zoe-Fashion Plate wearing a necklace crafted by a South African Artist!!! Zoe on Her New "online" Store!!! Vintage Fashion's got a song that only a Port Arthur beauty can sing. Where is she from? Well, Port Arthur Louisiana of course. How did you choose a name for your boutique? 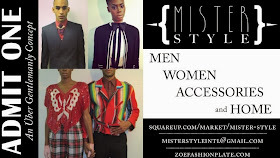 I named the boutique Mister Style to appeal to the fashionable male whose fashion sense is a little bit off the beaten path, and who is sensitive to seasonal changes regarding it or who aspires to be. Was opening a store front your idea, or did someone talk you into it? It was, definitely, my idea. I just had to figure out how I was going to go about running it, if you will. I have, and it will be primarily, online. and it is an extension of Fashion Plate Lifestyle, however, only the women’s side. 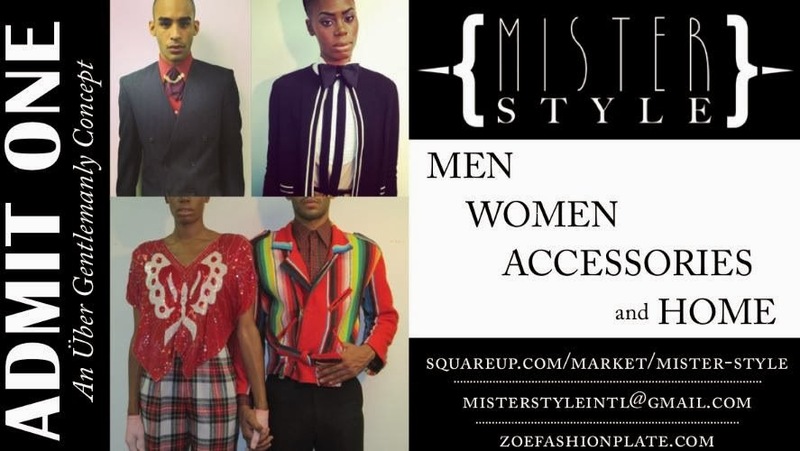 Mister Style offers merchandise for the men’s side & shows women how to utilize menswear in their wardrobe as well. Is this a second career? No, I think it is tied for 1st with my love for music because for me they are both intertwined. When I’m singing or performing or simply attending an event, what I’m wearing matters, and I think that is true for most people. So, I am also a stylist for artists in various mediums, i.e. music, art, etc. Why retail? Well, it falls in line with one of my loves which is fashion, and I love to help people achieve the look that they’d like to have or discover what that look is. Do you have plans to expand? In terms of expansion, I don’t think that there will be more locations, but there may be business that focuses on another aspect of fashion. Do you still have the same type of merchandise and customers as when you began? Yes, I still have some of the same type of merchandise in terms of pieces from the same quality-driven, legendary designers because there is a vintage aspect to some of what I offer that fits into that “what’s old is new” adage. Regarding customers, I have a very loyal base that has been with me even before I opened the 1st store, Fashion Plate Lifestyle because I had been called on to be a stylist for some of them. Based on the satisfaction that they had received from that service, a trust in my abilities was developed. What helps you retain business? Retaining business depends on what is offered, how it is offered, and the way it is offered. In my case, making sure my inventory is seasonally accurate, and stylish made available at the time the customer requests it, and done in a professional and courteous manner. Do you have a certain strategy on customer service? Yes. The strategy is simply to place a premium on those two words because customers expect excellent service, and if they don’t get it, they have the right to go elsewhere with their business. I, as a customer, feel the same way. Where has your success come from? I think my success has come from my ever-expanding knowledge in the area fashion. My attention to detail, my work ethic, and the value I place on customer service. Have you had any struggles/ challenges? The struggle, sometimes, can be customer consistency. The number of sales vary each month, so it can make it difficult to determine when to replenish inventory, and by how much. The challenges are being a one-person shop owner, and being available practically every day, but also, needing to balance participation in other events in town or away from the city that can secure more new business. With the economy still in the early stages of recovery, how do you feel about the future of your business? Do you think we’ll break out of the funk soon? I think the future is bright, because fashion is so important to so many people. People will find money to get the things that they want like that new outfit for that special occasion. You know everybody has a birthday, and often a celebration they’d like to attend in honor of it wearing something new. I think, overall, the economy is improving although some businesses were not affected or affected very little by the economy because there are a lot of wealthy people out there. Million dollar homes are still being sold in spite of the economic times, for example. You’ve been recognized for your Vintage Pieces, How would you describe your store’s style? I take great pride in the items I select and offer to our customer base. Oftentimes it’s hard to tell whether or not a piece is vintage, because it is of such quality. Quality is important to me and also items that have a long lasting style to them. My aesthetic is wide as fashionable finds span the world. I have a world viewpoint when pulling items from many countries & cultures to make up the style in Mister Style. I see you have both men’s and women’s clothing, How do you decide what to carry? I put myself into the mindset of a traveler who happens upon a store that allows them to go places in their mind of nostalgia & before they leave, hopefully, have found a great treasure to take with them for themselves or someone else. One-of-a-kindness is truly the goal whether the apparel piece is trendy or vintage, for example. Even new pieces can be unique if it’s not something that is mass-produced which is also part of our offerings. I also take huge hints from worldwide popular culture since most people desire to live vicariously through the most popular people in the world. This sets the tone for several of the trendy pieces that are among our selections. What are your favorite trends that came out of NYFW for Fall/Winter 2013? What trends are youstocking in your store? NYFW offered a very nostalgic viewpoint which makes it easy to select gingham, plaids, houndstooth patterned influences paired with florals, stripes, camouflage & leather...traditional patterns & textures to add with that crisp white tee or shirt...Naturally, Mister Style will offer its take on these ideas. Do you have any favorite designers, fashion icons, or style idols/ celebs? I am forever falling in love with those who create fashion & the style of it. There are designers that the world has yet to know and those who we can’t deny knowing, that I am in awe of. To name a few would deny the platform to all. We all have something magical to offer this world of fashion & I am interested & taking note of it all. What are your aspirations for your business and in life? To do so much good in all that I do that those who choose to pattern themselves after me will have a great start in building their own legacies. I desire to learn all that there is to learn and pass that knowledge on to keep this train moving. I consider myself to be a legacy builder. I'm proud to say that I am witnessing me being duplicated often. It's a huge compliment to this lil’ girl from Port Arthur, TX. I know you are at the store almost 24/7, but what do you do for fun to break away from it all? Correction...I’m not @ the store 24/7. However, the store is always on my mind as I think of ways I can enhance it while I travel the world. For fun, Houston is an international city w/ great museums, theaters, eateries, parks, shopping facilities, etc., so there is much to do, but for me it's more about the people I spend time with that bring about my joy no matter where I am. My daughters are #1 to set the pace for those joyous times. I will just leave it at that. Do you have any advice for anyone out there who wants to someday own there own boutique, or step into the fashion industry? Be knowledgeable about the industry & do not close your ears or eyes to any level of it. I'm continuing to learn... this is how one continues to be successful & that's what, ultimately, anyone would want out of any job they choose. Deborah Duncan, Jennifer Holiday, Zoe, Models!!! Zoe-Fashion Plate presents her stylized models on Great Day Houston!!! The fashion side of Zoe interviewed during Houston Fashion Week!!! "Great Day Houston" - Deborah Duncan!!! Zoe pulls out all the stops for clients! Zoe Graces the Mic in Dallas!!! Big ups to the coolest chic on earth Zoe. Thanks for staying and coming through the Prophet Bar and blessing us with your voice. Zoe definitely set the tone for the evening. Man, the Prophet Bar open mic was in rare form last night. Zoe “Shouted Out” from Big “D”!!! Shout out to the beautiful Zoe Chrizcera, who performed our song "Long Way Home" at her Houston mini-concert. Zoe's music is as beautiful as her voice and what a pleasure it was to be blessed with her performance. Keep doing what you do, Zoe! We love you! Check out Zoe's Facebook page for her electrifying performance! Zoe and the “Grammy” Guy!!! Big “D” Visit with Producer Jah Born!!! My girl Zoe came through D-Town and brainstormed with the god. Peace and love Zoe. Men’s Night Out at Ovations!!! Singing is in the Air!!! Paper City ON Paper City? 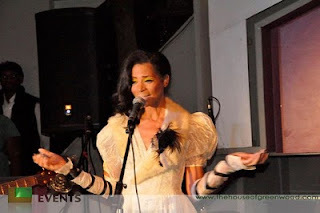 "Through music, I have garnered the attention of many...Thank you Patti Labelle, Roy Ayers, Brian McKnight, Kyle Turner..."
"…a songbird with fashion model looks and cheekbones to die for..."
"...I’m inspired by all that the world has to offer and the fact that my purpose is in the midst of it all." Zoe Jackson-Jarra of Zoe Fashion Plate is a stylist, designer and musical artist here in Houston, Texas, and I was given the opportunity to pick her brain. Read below to see what she had to say. Tell me about your life as a singer, stylist, and boutique owner. How do you manage it all? I manage with early mornings and sometimes late nights if I have singing “gigs”. I have a to-do list that I usually write at night and examine the following morning, and try to do only those things that I’m “led” to do. I have very productive days and God gives me the strength and the grace to do it all. What keeps you inspired? I’m inspired by all that the world has to offer and the fact that my purpose is in the midst of it all. As an admirer of your style, I would like to know is your everyday look always fabulous or do you have days when you prefer to be super laid-back? Thank You. Well, first and foremost, I love fashion, so, I love to play dress up, anyway, but also, as a representative of a retail clothing boutique, there is a certain responsibility that goes along with that. I, also, however, have my laid-back days, sometimes, depending on what I have to do that day or when I’m traveling long distances or something for the sake of comfort. What is your forecast for Fall 2014 and spring 2015, if it has crossed your mind. What are your thoughts on Fall 2013 and spring 2014? I don’t really have a forecast on fashion in terms of seasons because I incorporate whatever elements that are out there with my own perspective. And, of course, at the end of the day, it’s all about customer satisfaction, and, the fact, that I know that they are coming to me for a one-of-a-kind uniqueness in their personal presentations. I do have a musical forecast, however, in that, the two are connected. My fashion is a reflection of my music and vice-versa. With that said, the company I co-founded, Zoe and Dede Publishing, is preparing to launch groundbreaking music that will be intertwined with fashion this year and for years to come. I understand your boutique is now closed. Is it headed online? What will happen to your amazing collection of vintage and signature pieces? Yes, the store has closed and has been online for quite some time under the supervision of my daughter, Ciera. Also, I will continue to have a collection of vintage and signature pieces because I am still a stylist for artists of various mediums including singers, painters, designers, and others, and, of course, myself. How’s the Houston fashion market for vintage wear & styling services? I would have to say it is 100 percent appreciated by my clientele. That’s how I see things because everyone that comes to me is coming for what they already know I offer in the way of vintage wear and styling services. For those who aspire to be a stylist and boutique owner, what tip would you leave them with? Well, there would be a few tips that I would leave them with. Be knowledgeable about your interests in terms of the marketplace, the forecast in fashion and how to create prosperity in order for it to be a viable business. We are now selling both designer and vintage multiples online. We’re launching an additional online store next month called Mister Style. My songwriting partner, Derda Brantley, and I are also working on several songs for an internationally recognized actor/country artist! We will release his name next month. "Zoe" Love in the Big D!! A Girl & and Grammy Winner Do Dallas! Fashion Plate Boutique Participation Anticipated!! The Fashion "Soul" of Zoe Speaks! Artistically Empowered…This week’s Featured Dawning Soul is Chrizcera Zoe. She is an artist whose canvas includes a mic, a message, and ever-evolving meaningful moments. She is inspired by the “fabric” of life and its limitless possibilities. She uses fashion and style as a medium to give back and help empower the next generation. If you’d like to learn more about Zoe, visit her site http://zoefashionplate.com/. Zoe is rockin the Dawning Soul “I AM” Poetic Crop Top. I got the opportunity to interview Zoë. Check out her story and the fashion legacy she and her team are building. Zoe Jackson-Jarra is a visionary and leader in the fashion industry. She loves expressing herself through her unique personal style combining vintage and new pieces. Having a long and successful career in the fashion industry, she is passionate about sharing her knowledge to the next generation. She loves the entrepreneurial spirit and believes it is her responsibility to pass on the prosperity of knowledge. Money fades. It’s about more than selling clothes and styling. It’s about passing the baton to young emerging leaders and help them experience success in their own way. It’s about spreading something real for this new generation. She believes true success requires authentic intuition and having faith in oneself. The creative process is organic. You have to be aware of the information that comes to you. Then you have to sitting with information alone to know what’s right for you. If you listen to inner voice, the answer will come. It’s important to be patient and allow it to procure. As a leader, you need to trust your own process to give you the greatest result. In creating your personal style, ask yourself what is the goal at the moment? Be conscious of where you’re going and who you’re with. What message are you trying to send by presenting your art in what you wear? See fashion as something you want to explore and invest in daily. Choose pieces that allow you to endure that day. She suggests to map it out based on your circumstantial means. For example, she loves layers when she dresses so she is prepared for different types of situations during her day. Zoe loves vintage because it is her sustainability platform. Vintage is not wasteful. It allows you to remember beautiful times and people of past and keeps elders close to us. Vintage Creates individualism. She is present to the moment and always wants to offer more choices to people, and not about just what she likes. She loves all cultures. She travels and brings things to share with others in her space. She wants the experience at her boutique to be personable. She believes people can curate their own lives and allows people the freedom to be. Zoe’s future goal is to do pop-up stores all over U.S with her young stylists. She wants to work with non-profit organizations. She will also expand her online presence and offer her exclusive styling services. She considers herself as a “Fashion Fairy Godmother” to many young people to help them create balance to make money and independence. She loves grooming young people and investing spiritually in their success. She is currently mentoring three young stylists, Adreinne, Dannielle, and Josias. Zoe knows that her legacy needs to continue. She offers her young stylists support for their dream. She wants to show them that it is possible to be successful with your passion. Her goal is to help them prosper. She instills in them to be the leader and not be led. She believes the biggest fuel comes from young people. You have to move with the movement. Fashion Plate Lifestyles in Vogue Italia for the 3rd Time!!! The image of model McKeliah Beth is set against a "backdrop of beauty" created by the "Father" of us all and captured by phtographer Brian Styles. The dress and style are products of "Fashion Plate Lifestyles Boutique" and the fashion sense of Zoe Jackson-Jarra!!! Hooray for Fashion Plate's 3rd appearance in Vogue Italia Magazine Online!!! Fashion Plate Gets a Mention!! The last batch of looks comes from Fashion Plate Boutique, located at 4317 Montrose Blvd. Fashion Plate offers vintage, re-purposed and gently used clothing that the buyers specifically pick out with one thought in mind: that the new owner of the garment will love it like it’s brand new. All the looks in this group were comprised of vintage and re-purposed garments and accessories. The vintage straw oversized totes that were showcased definitely stood out for me as one of my favorite Spring 2013 trends. Zoe - Fashion Plate Makes the Paper!! Clockwise from the top left: Vintage hats and purses can be found at Fashion Plate. Owner Zoe Jackson-Jarra. Vintage styles at Fashion Plate. 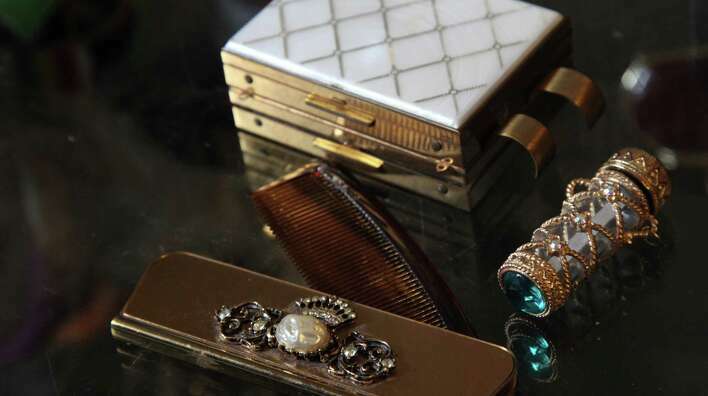 Above: Pretty accessories, such as compacts and clutches, on display at the Montrose boutique. As a professional singer and songwriter, Zoe Jackson-Jarra makes a point to never wear the same thing twice. It's her unwritten dress code; her unique statement about style, music and vintage fashion. "Part of the entertainment value is to give the audience something new, whether it's re-mixing or rearranging a song or having a different look," she said. "I want create a surprise every time they come to see me. " Vintage clothing allows Jackson-Jarra the freedom to change her looks onstage and off. "It's all about investment pieces," she said. For nearly 25 years, she has been collecting vintage apparel and accessories. She also owns and operates Fashion Plate, a vintage clothing store on Montrose, in addition to performing and managing the careers of other musical artists, models and fashion designers. Jackson-Jarra said she wanted the Montrose store to feel like her giant closet. It's overflowing with finds from Houston and cities across the country, but small towns often have the best treasures, she explained, wearing a top by Houston designer Selven O'Keef Jarmon and Seven for All Mankind jeans, along with one of her signature vintage hats. On one wall of the store hangs an Esther Wolf sequined dress with an empire waist (1960s); a butterfly belt from the 1980s and a metal 1930s purse are showcased on a nearby counter. There are classic Prada and Gucci men's bow-ties, as well as racks of cocktail dresses by such classic designers as Yves Saint Laurent and Oscar de la Renta. "Being around small towns, like Port Arthur, you tend to find the antique pieces at such a great value. It's quite phenomenal." She named the store Fashion Plate as a tribute to her Port Arthur roots. It's a term she heard often as a child used by the stylish ladies of her community. Jackson-Jarra said she also learned about style and music growing up in a blended family of 11, with a father who also sang country music. Her first vintage find was a chest set made of ebony and ivory, but not knowing its value, she later sold it for little to nothing. Now, she continues to share her knowledge about vintage fashion with her daughters, Ciera Rogers, 25, a Los Angeles fashion stylist who operates the store's e-commerce site (cierarogers.com) and Christina Rogers, 24, an author and songwriter. Jackson-Jarra's husband, Sulayman Jarra, is an art dealer and collector and owns the African Art Center, 4503 Montrose. "I'm so inspired by so much, especially art," she said. "We're all drawn to certain things. Sometimes, it's about that one piece." As for her one signature piece, she has a few: capes, sheer gloves, watches and, especially, hats. "I love Turner Classic Movies; all the leading ladies wore hats," she said. Media moments in print is what you'll find here regarding Zoe -Fashion Plate and Dede the writer. When aspiring for a fresh breath of style, it is not uncommon to find a desire for articles of clothing that exude timelessness, quality and uniqueness. Although few and far between, vintage & boutique shops have been the go to avenues, and continue to hold their prominence as the anchors of style. From classic jackets, to antique jewelry & watches, every visit is a pleasant adventure with treasures waiting to be found. Fashion Plate founded & established by Texas born singer, song writer, fashion stylist & designer, Zoe Jackson-Jarra is nothing short of a treasure chest. Rich with years of experience in the music and fashion industry, we set out to take a deep insight and discuss with Zoe about what it means to have an individual style, and the many appealing items on the Fashion Plate menu. S-Gents: So tell us a little bit about yourself? Zoe Fashion Plate: Well… ever since I can remember and at a young age, I held a strong interest in the arts, particularly music. My musical preferences and musical style include jazz, and R&B, and have been compared to Sade, Erykah Badu, Shirley Horn. As part of Zoe and Dede Publishing, our catalog of written songs include all genres of music from country to pop. As we all know, part of music is to be aware of what your image is. And as a part of that musical journey, fashion opportunities presented themselves, especially in terms of modeling. Having been known for possessing a solid and unique sense of style along the way, I have been blessed to work with many different artists. At this point, my interest lies in helping others pursue their aspirations in the arts. So my palette for fashion is varied as our clients need for their audiences. S-Gents: How did the establishment of the store come about? Zoe FP: You know, it really came about by being a music artist as I mentioned earlier, and I decided to help more artists with things they were trying to achieve with their image. I ended up becoming a dual artist in regards to fashion and music. When artists needed help with their album covers, or even photo shoots, they sought my assistance. I would bring racks of clothes that I had pulled from things I had, and had personally collected over the years. I began to gradually add to the pieces I had, and it became a palette built on what the people I knew needed. To date, I have been collecting for about 25 years. S-Gents: Interesting. So what about the process of collecting? What exactly does it entail? Zoe FP: The process is pretty simple actually. I know a lot of others who style and collect in terms of vintage clothing & accessories. And so a big component of the collection process is getting in touch with people that you know, and checking in frequently to see if they have certain pieces. People even gift their collections to people whom they feel will give it a viable presence. They are either willing to sell or give it to you. You use what you can, and as for the rest, you give to others in need. It’s really your interpretation of what fashion needs to be. S-Gents: Very well then. What’s your fashion preference and how would you describe your taste? Zoe FP: My personal taste in style tends to be layered in dimensions of time or even region. Something you can peel off and/or put on. The weather defines a lot of what you can do. I tend to layer a lot in things that are balanced, whether simple or complicated. Combinations of many different styles blend together in certain ways, and they do not have to overpower one another. You start simple. Maybe add a sweater, then a small skirt, a slip, jewelry, and accessories like necklaces and such. You don’t want the style to lose itself once you take off one item. You still want it to look like something. I also like to know what my client's likes and preferences are, and include that in the styling ideas as well. S-Gents: When styling, are you going for a certain image or is it really a work in progress that leads to a final image? Zoe FP: It really depends on what you are going for. If you have an end goal say for a photo shoot, musical showing, or event then you work towards that, and if not then you just patch things on, along the way. S-Gents: Houston weather. As we both know, our climate here is very different. So much so that it’s often difficult to follow trends & styles in national media, magazines or international style blogs. How does that play into the Fashion Plate collection? Zoe FP: We keep within the industry seasonal chart. Even in the summer we have access to furs. People could be traveling anywhere; we are set to be a destination store so we need to have everything. We always have a combination of things, regardless of weather or climate. We always have trendy things in terms of current and projection. Typically when you live in a certain city, be it Houston, Chicago or New York, you’ll already have certain items that are the norm and readily available, and so there wouldn’t be any incentive to come here for that. I always opt to adhere to the client’s request. I don’t force fashion down anyone’s throat. Catering to the demands of clients is priority. S-Gents: What about Fashion Plate, and how did you end up with such an interesting name? Zoe FP: When I was younger there were women in my cultural upbringing, from a lot of different nationalities and different backgrounds. They would always comment on people being a ‘fashion plate’. They would look at me back then, and say “Oh look at her she is such a fashion plate”. It’s almost like saying everyone can be that. Everyone can be a star. So you can be a fashion plate. And that was really how the name Fashion Plate came about. S-Gents: Tell us about what you carry, and why shop here? Zoe FP: The first reason of course, is that we are creating a destination place, for people who travel to Houston. It’s a unique place to come and get a little nostalgia on the level that we are able to offer it. Here, things are not so structured, not so reselling, but very inviting. We are striving to make people feel as though they have the largest closet in the world. Our intent is to create a platform for those who want to stand out and be an individual in what they wear. Fashion Plate is more of an international spin as opposed to 70’s or 80’s clothing. There are articles of clothing from Asia, Europe and such, not just trends and styles here in the states. We are also striving to make it a lifestyle as well and so it’s not just about clothing. We have home goods, plates, chairs, goblets, wine glasses, etc so people come here for that as well. We also sell South African jewelry and hold a high interest in African items, due to the fact that our family sells African art. We find that people want a taste of Fashion Plate when they go home, so we allow them to purchase a little bit of that, as well as the clothing. S-Gents: Well that is certainly more than one good reason to shop Fashion Plate. Your advice for the fashion novice? Zoe FP: Hmmm. I’d say take what you know as a beginning palette and just add to it. It could be something simple, like say a pocket square for a guy, or a tie pin, or a funky pair of frames and flip out the lens. Take a small dose at a time. It could even just be a carry bag. One thing at a time, until you understand what it is exactly, that draws you to that item. I say this because you tend to be able to create a little bit of uniqueness with what we have to offer here, because it’s something that’s neither repetitive nor recurring. You know, it’s not like saying I need a pair of pants. You come here to find unique items. A cheat sheet is also nice to have. Find magazines and online blogs, and rip out pages or save pictures of things you like. Create a carrying of things that you like and just start compiling. And this allows you to use that as a template going forward. S-Gents: Excellent points you make Zoe. Definitely couldn’t agree more. Let’s talk popular items in stock at Fashion Plate. Zoe FP: Blazers are definitely on top of the list. We pride ourselves in making sure we have many of those in all sizes. Vests are also quite popular, since those look unique when added to a suit and make you stand out. A lot of pocket squares are available as well. We make a lot of those out of different fabrics that you don’t even see anymore. Included in a list of our popular items are tie pins, hats, shirts, depending on the season, sweaters, bowties, neck ties, and boutonnieres. I love boutonnieres. And it’s not just for when you’re getting married, we have those as well. You need to get one by the way. Zoe FP: Yes. [nods head]. Knickers and kilts, you know things that are very fashion forward. Sheer as well. We’ve been doing sheer for a long time and now it’s in. Sheer button downs, swim wear, kaftans. Sometimes it’s just the point that people feel like they have to have a faraway place to go before they wear these things, as opposed to just something you throw on when you’re at the house on the balcony, or casually hanging with friends. It’s self dictation. Style is dictated by one’s self as opposed to following trends. Fashion forward youth sporting​ a kilt in modern day style. S-Gents: In agreement once again. I see Ms. Fashion Plate definitely knows her stuff. What’s your take on great things going out of style…and coming back? i.e. Double Breasted suits, turn up pants, fitted clothing, pork pie hats. It also helps you gentlemen concentrate on your health and physical appearance as well. Also, certain fashion trends ignite emotion. Take fear for instance... like why wear studs on your jacket? It invokes fear. You really are sending a message with your jacket. You make a statement with your style. And it’s all about embodying greatness, making you feel good about yourself. And that’s what fashion does, it moves people to order. Either you are going to run towards it or away from it. And I am excited about where fashion is going. S-Gents: Well, so are we, and we couldn’t be more thrilled to hear that. What about your audience? Zoe FP: I choose to stay with the young people. Older folks are less willing to change, and it’s all about inspiring younger people about possibilities of what can be. I see myself as a legacy builder. All day long. Whoever I can give it to it’s going out. That’s what I stand for and that’s the new movement. Fellow Gents & Belles, be sure to make an appointment and visit Fashion Plate Boutique. You definitely won’t be disappointed. Fashion Plate Lifestyle Boutique twin models Dannelle and Adrienne cause a double-take for Jamsource Magazine viewers and readers on the cover of the December online issue. mentioned in “Vogue” Magazine – Italia! Fashion Plate Lifestyle Boutique stirs emotion! Who would have ever thought the pages of Paper City Magazines would be used for more than ogling their beautiful layouts? "The gallery also hosted PF2, a fashion show …to create art crafted from PaperCity magazines that models wore during the show." The International Festival of Houston lets the eyes have it! "Fashion Plate Lifestyle… offers unique, beautifully made garments." South Africa sends its best! "Zoe Jackson-Jarra of Fashion Plate is representing the line in the states."